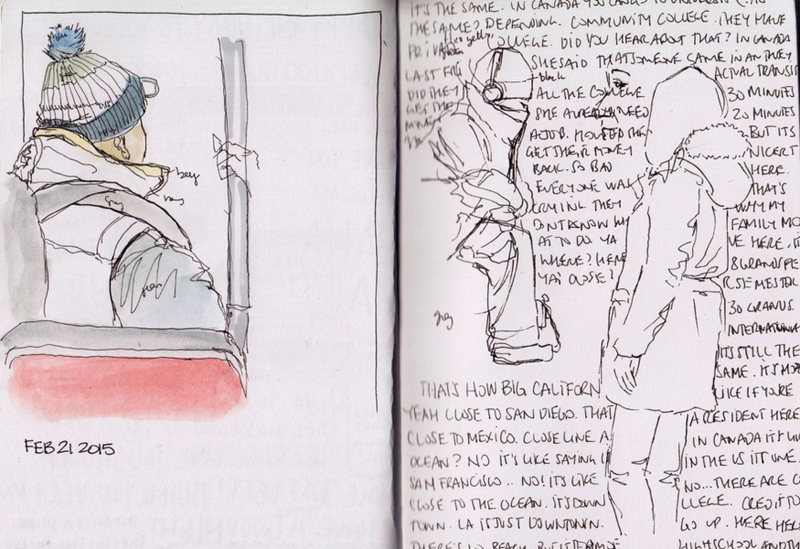 A couple weeks ago I started a new sketchbook and drew a couple passengers in the subway and streetcar on my way to various events and meetings. Above was this guy I drew while he was sleeping. It is one of the easiest subjects to draw because they don't move a lot so it gives me time to get more details on paper. 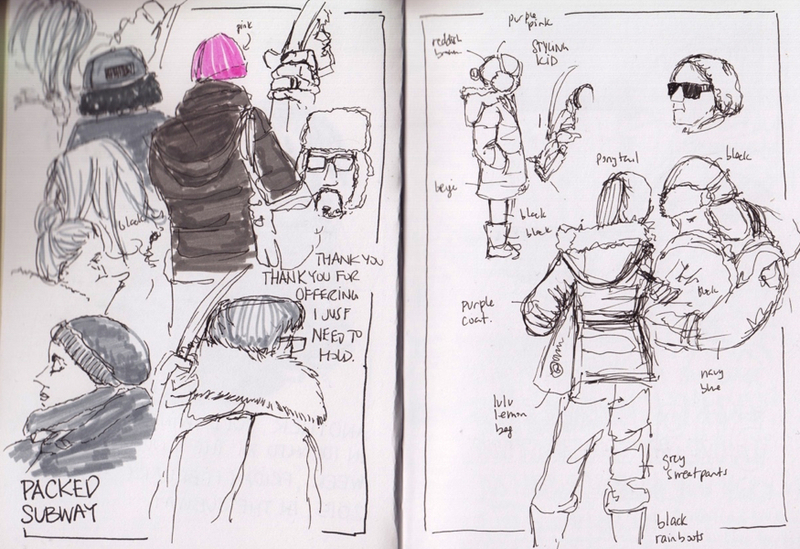 The subway was packed (top right) so I drew what stood out. I also like to take notes of what I hear every so often and also note down the colour of people's outfit so I can add it later. This time I decided to keep most of the sketches in black and white, for now. It's fun to see the various styles and what people chose to wear. It says a lot about their personality and mood. This little girl (probably around 7 years old) was wearing the cutest little outfit with pinkish earmuff. I had to sketch her. She looked so serious and focused. She barely moved while I sketched her. On my way back from the exhibition place, there were a lot of kids sitting in the back and the adults in charge didn't have much control over their volume. It made for an interesting ride. Some people were cringing, others were talking louder on their phone so the person on the other side could hear them. The sound took over the visuals so it felt more appropriate to write down what was going on instead of trying to sketch the crowd around me. 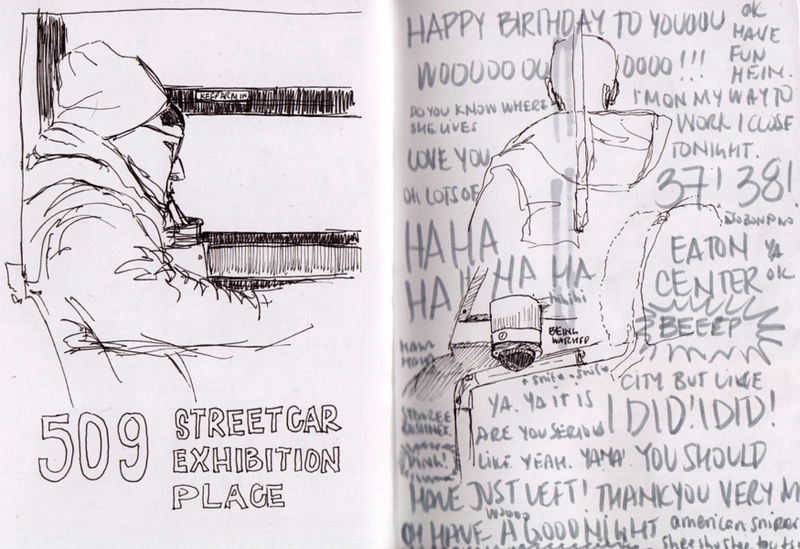 After the kids left, I sketched a little more in the streetcar. 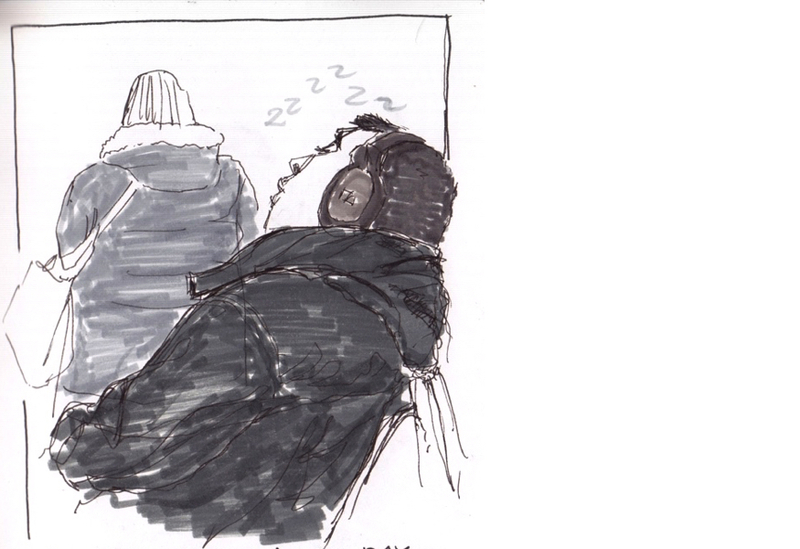 By the time I got in the subway there was another loud conversation going so I added bits of it to my sketch as well.